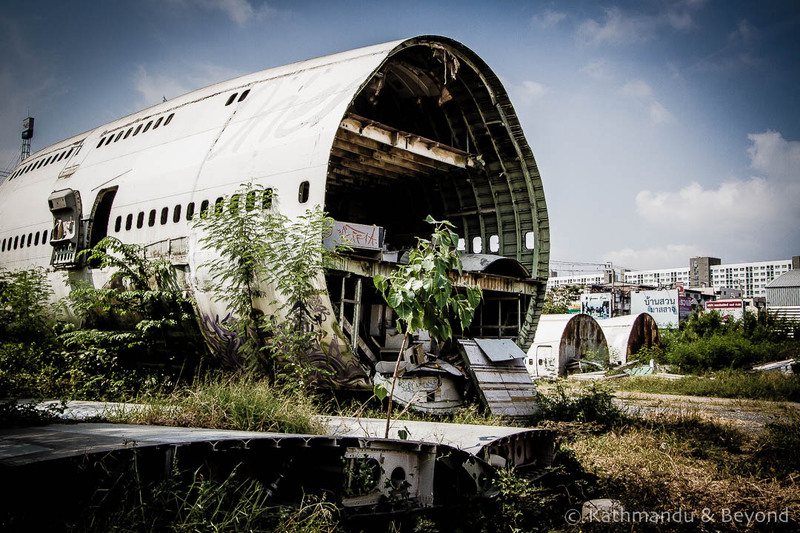 What is the Airplane Graveyard? Named after King Ram Khamhaeng, the 13th-century ruler of ancient Sukhothai (the forerunner to modern day Thailand), the eastern suburb of Ramkhamhaeng is home to one of Bangkok’s most unusual tourist attractions. 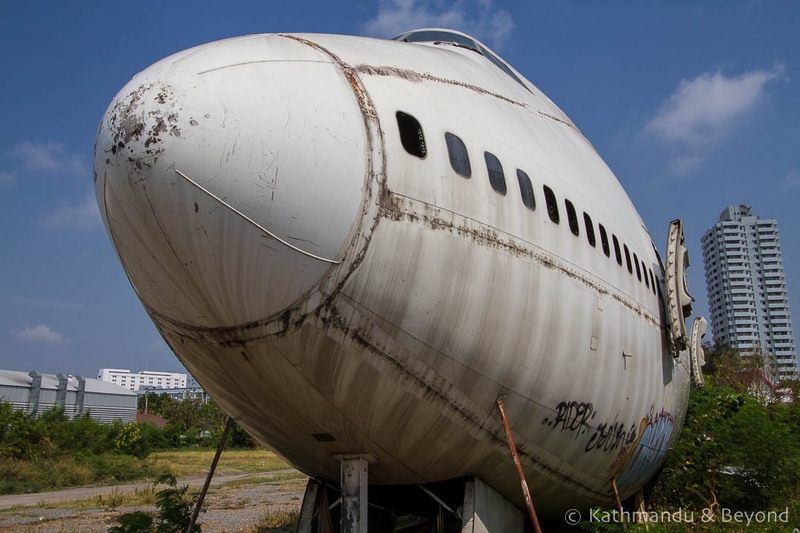 The airplane graveyard, as it has been dubbed, is literally just that: a large, open wasteland in the suburbs of Bangkok that is now home to an assortment of deteriorating aircraft. 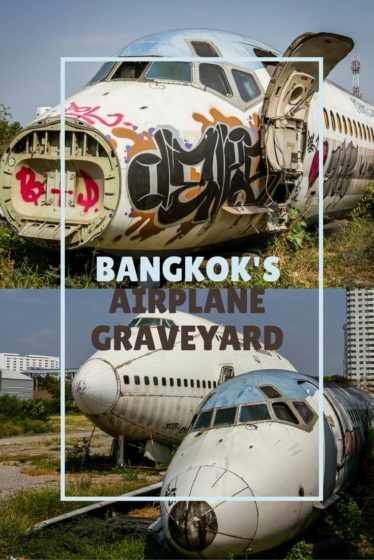 Scrapped planes have reportedly been on the site since 2010 and, by all accounts, the land (and its contents) belongs to a Thai businessman who has been gradually selling off the valuable parts of the airplanes for scrap. 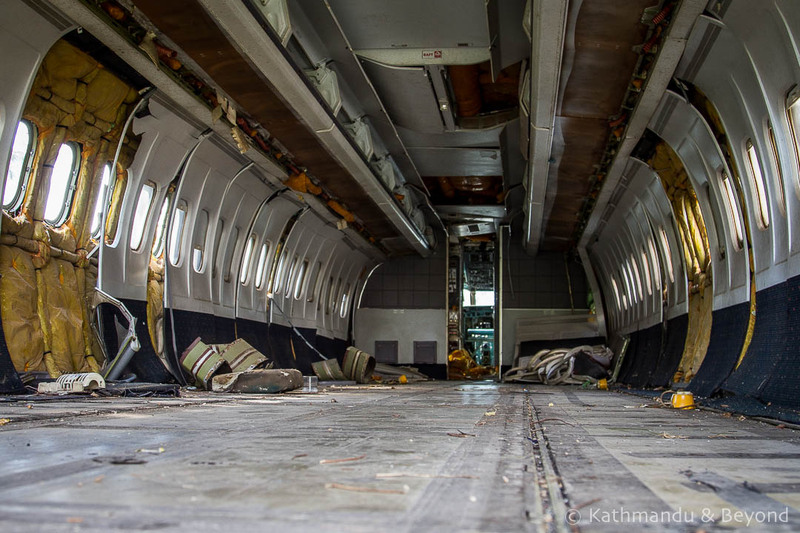 There didn’t appear to be much of value left when we visited earlier this year (April 2016) – the interiors had been stripped, wings dismantled and large sections of the aircraft had been taken apart and it made us wonder if the owner was now simply sitting on the land, waiting to realise the value of his investment. 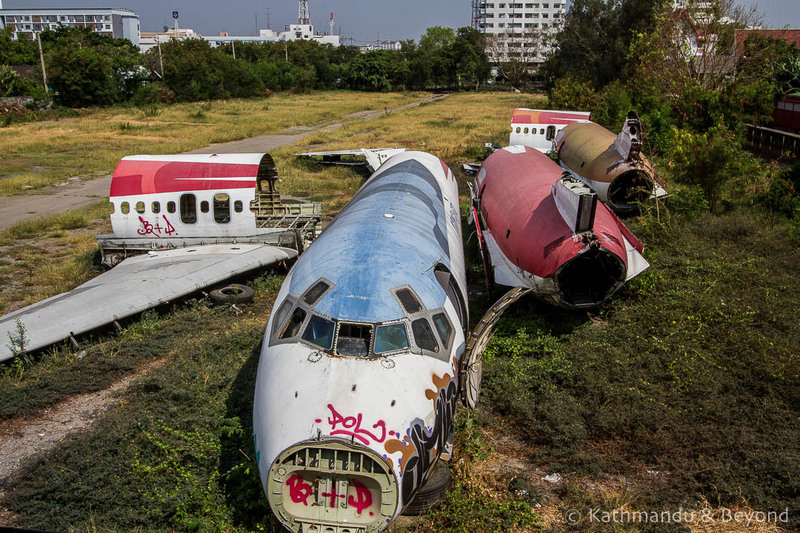 Visiting the location of the airplane graveyard is simple enough (see below) but there is an added twist. 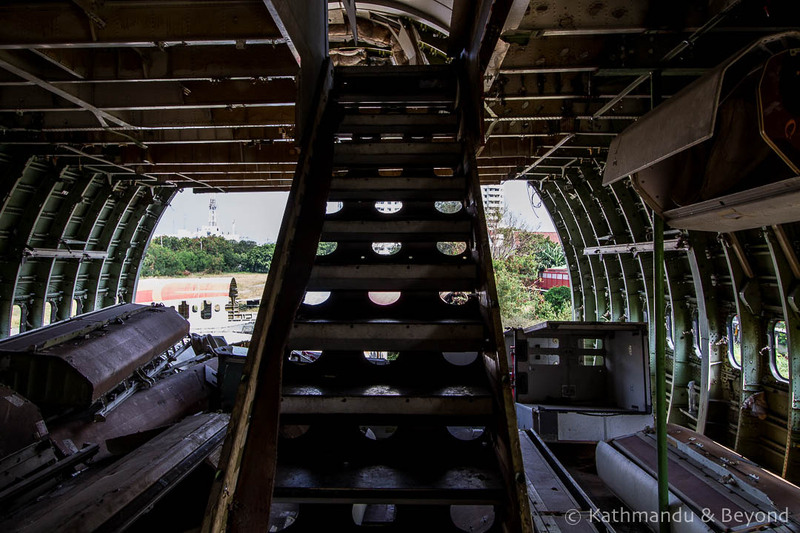 The site is also home to a few Thai families who live in a small shed close to the entrance as well as in the planes themselves. 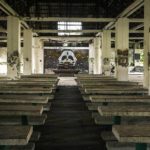 No doubt they began residing there because they were destitute and had nowhere else to live but, over time, the graveyard has grown in popularity among urban explorers and those looking for an off-the-beaten-track Bangkok experience and the Thais who call this place home have become unofficial security guides/gatekeepers and (probably with the consent of the land owner) now charge an entrance fee to enter the site. More on that later. 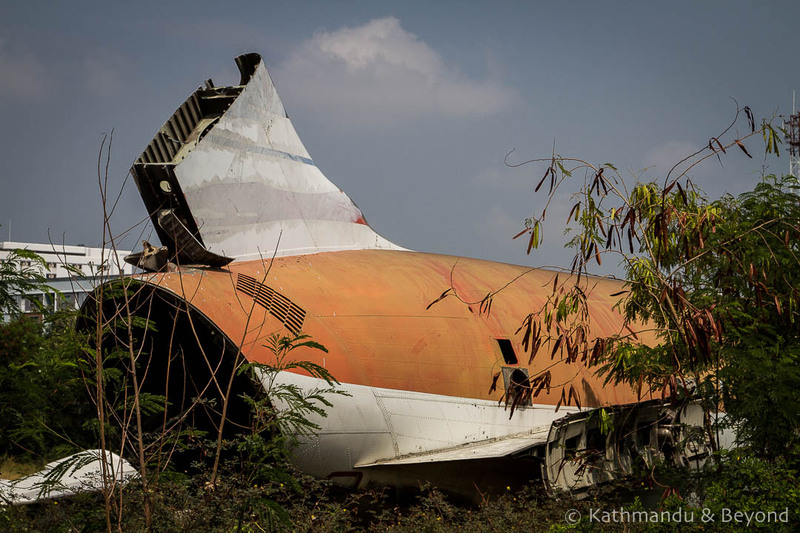 Currently, there is an assortment of wreckage inside the compound, including a couple of McDonnell Douglas MD-82s, strewn wings and bits of fuselage as well as the highlight of the show, a massive Boeing 747, which dominates the centre of the grounds. Once inside the gate, you are free to explore for about an hour or so before a member of one of the families finds you and tells you in no uncertain terms that it’s time to leave. Like the admission fee, this limit of approximately one hours’ visiting time, is another consequence of the site’s ever increasing popularity among visitors but there is little you can do about it, apart from perhaps smile and pretend you don’t understand if you want to try and extend this time period by about fifteen minutes or so. 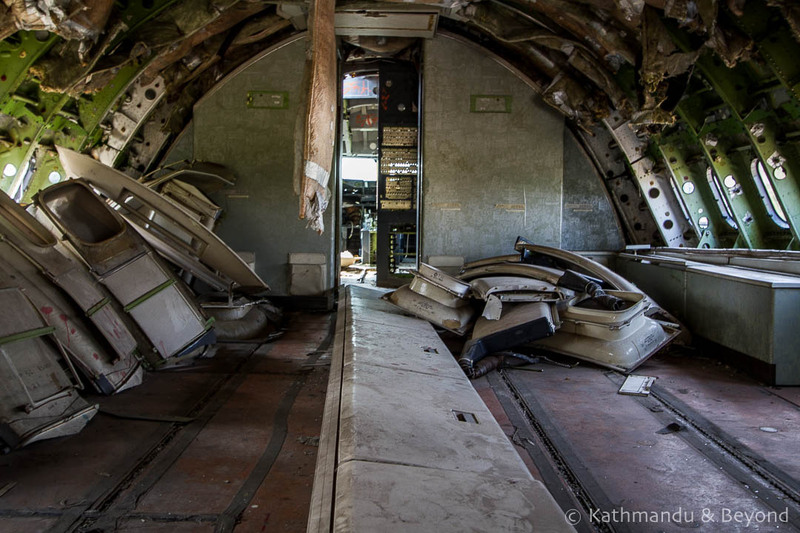 If you begin by exploring the Boeing 747 then, on balance, an hour is about enough time to see everything anyway. (*) Although I’m not nervous of the actual flying itself and being up in the air, I do dislike air travel immensely and will go to serious lengths to avoid it whenever possible these days but my dislike is more down to the whole airport experience since 9/11 and my fellow passengers who, on the whole, I find incredibly irritating. It is a bit of a challenge boarding the aircraft, let alone climbing to its third level where the cockpit is situated. There is no jet bridge or gangway for you to amble along until you reach the passenger deck. 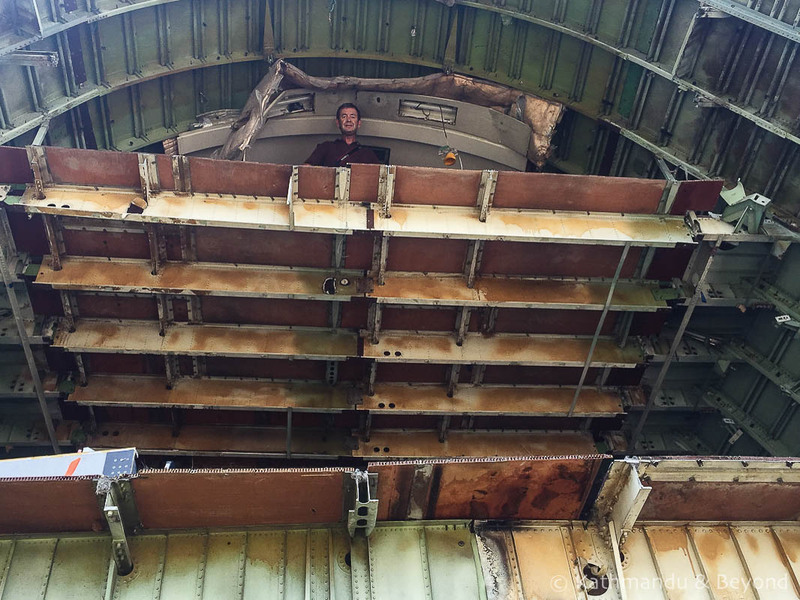 You have to squeeze through a half open cargo door and gingerly make your way up to the third level if you want to see what the driving seat looks like. I say gingerly because you have to be careful once you are inside. There is all manner of discarded matter on the floor, which itself has been stripped back to its bare form. 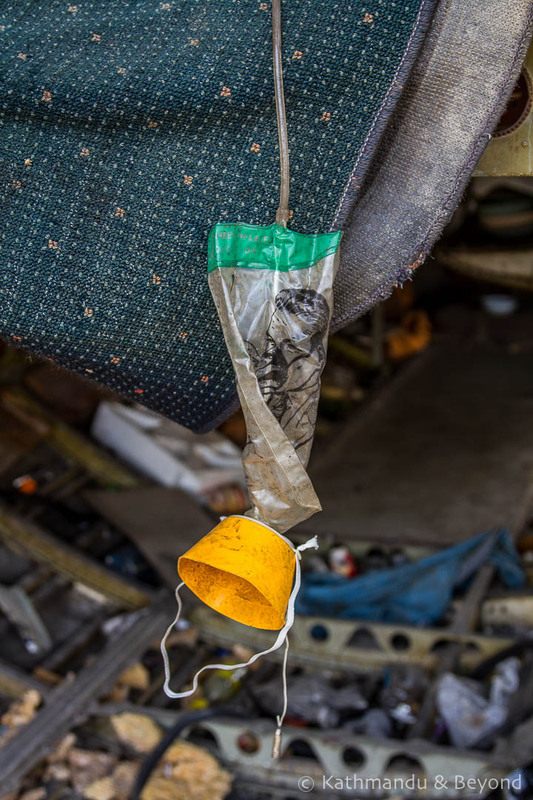 There is also, what I assumed to be, exposed insulation hanging out of numerous orifices as well as jagged, rusty bits of metal at every turn. It’s probably best not to touch anything and most certainly a good idea to wear a sturdy pair of shoes and even long trousers if you can stand the heat and humidity. I didn’t take my own advice, but do as I say and all that if you don’t want to run the risk of getting a nasty dose of tetanus! 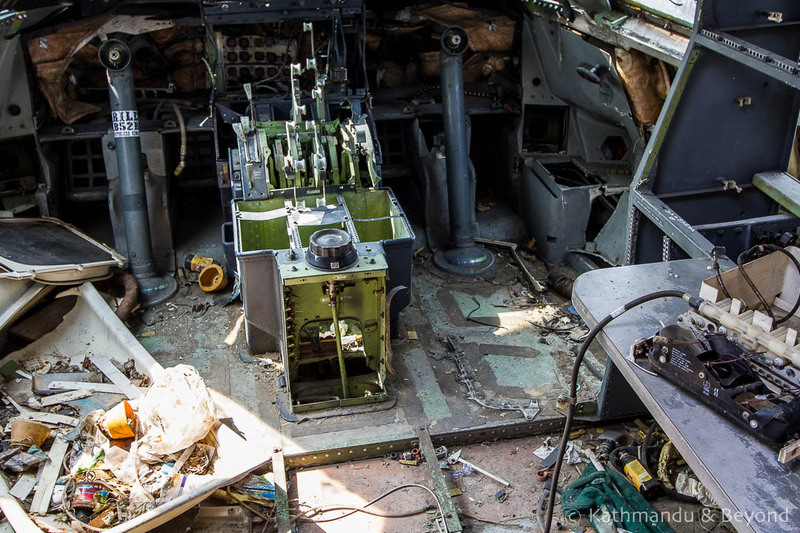 Even the outside area surrounding the airplanes is a bit of a minefield of nasty odds and ends so you should be observant when ferreting around there as well. There are particular areas that are off limit. 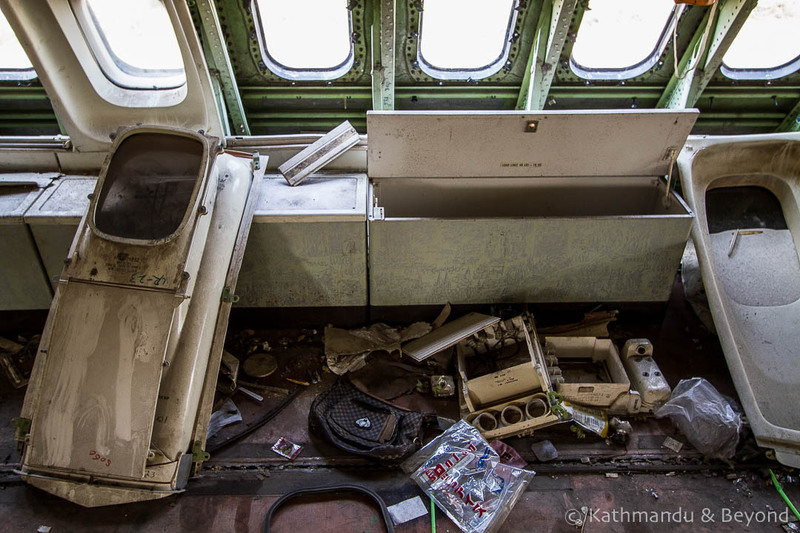 These relate to the Thai tenants, who have converted certain parts of the aircraft into sleeping quarters and places to live. If there is a curtain covering a specific area then you can be sure it is someone’s home so you should respect their privacy and not approach. 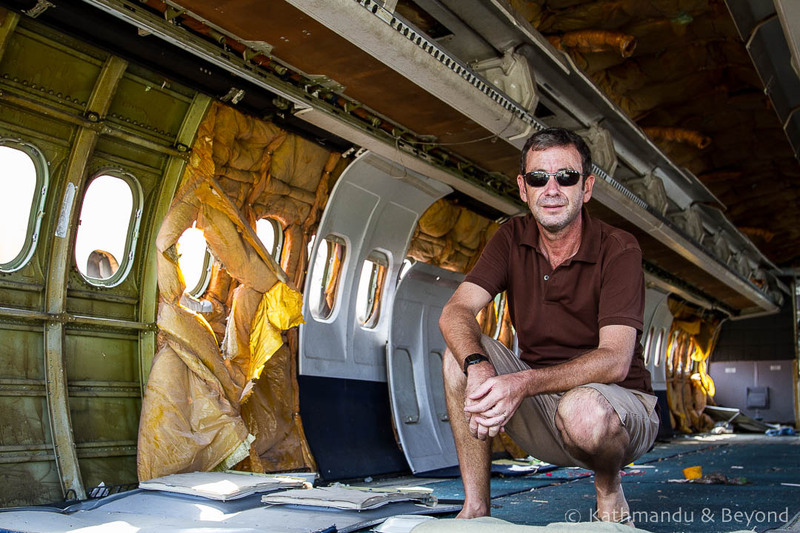 How much does it cost to visit the Airplane Graveyard? The unofficial entrance fee seems to vary depending on who meets you at the gate, the mood they are in and the number of people in your party. We were a group of two (Kirsty and me) and we were asked for 200 Baht (US$5.50/GBP4.40) per person. 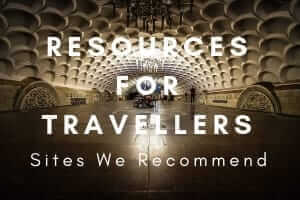 If you are on your own, the going rate would appear to be 300 Baht per person but we know of some people who have visited and paid more, some less. If you look on the Internet for similar blog posts, you will see that there is mixed opinion on whether the price is fair or not. 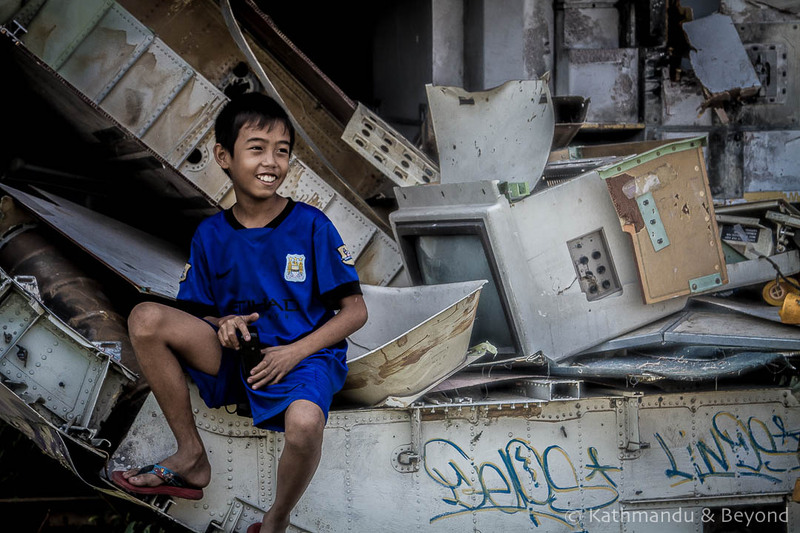 Some (rightly) say that the families living there are impoverished and should be allowed to ask for, what is in Thailand, a relatively high amount of money. Other say it is way too much, given that the average wage for a low-income earner in Bangkok is often below 500 Baht per day. By contrast, the Grand Palace and Wat Pho (Temple of the Reclining Buddha), two of Bangkok’s major tourist attractions, have entrance fees of 500 Baht and 100 Baht respectively. When we arrived at the gate, we were greeted by two young lads who asked for 200 Baht per person at the behest of a rather unpleasant lady who couldn’t be bothered to come over herself and just kept scowling at us (and the boys) when we tried to negotiate a lower price. She was having none of it and so we paid the full amount. Towards the end of our visit (i.e. when our hour was up), the two boys located us and pestered us for money while en route to escorting us out of the gate. They were friendly enough but we couldn’t help thinking they were put up to it by the unpleasant woman, who we assumed was their mother. The boys even came with us along the road for a while after we had exited, still asking for extra money. The crux of it is, don’t bother making the long trek out to the place if a) you think a minimum of 200 Baht per person is too high an admission charge and b) you aren’t prepared to pay whatever the asking price is at the time. It is unlikely you will be able to negotiate and there is no alternative way of entering the site unless someone unlocks the gate for you. Furthermore, there isn’t a 100% guarantee that you will be allowed to enter when you do get there. 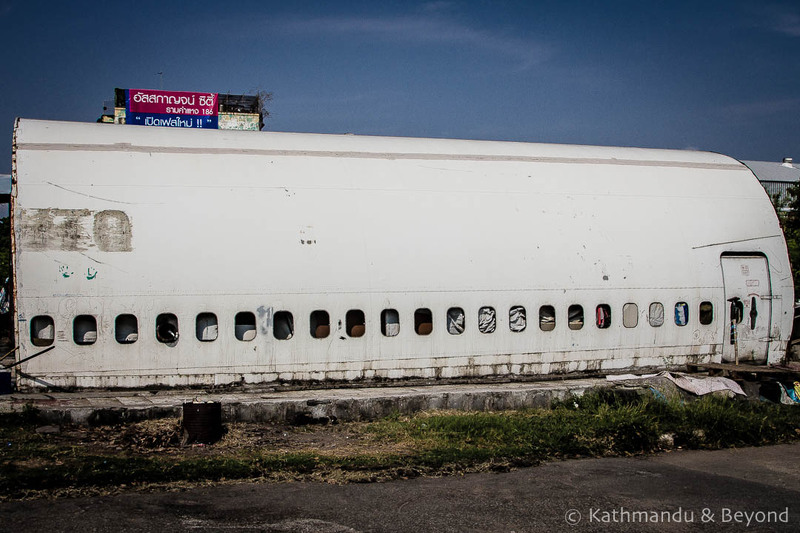 We didn’t think there was anyone around when we first arrived at the gate and it took a few shouts of ‘Sawasdee Krab!’ (Hello in Thai) before we got anyone’s attention. The occupants have also been known to say ‘no visitors today’ on occasion. 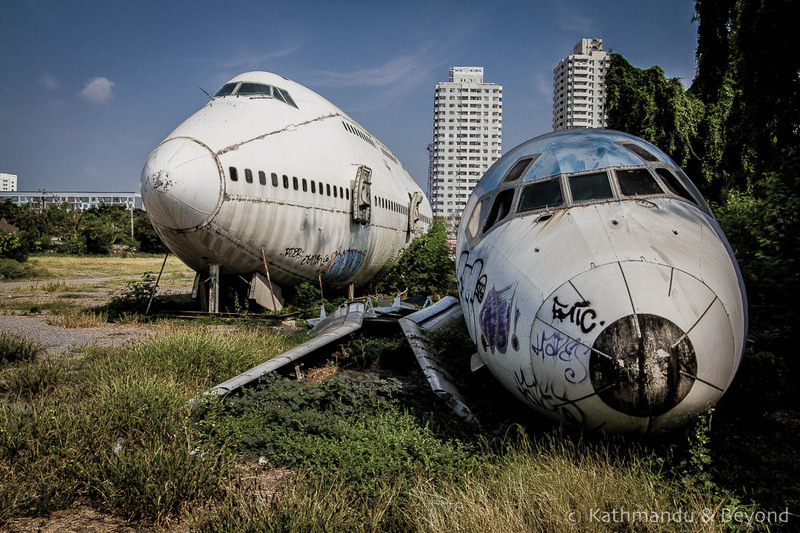 How do you get to the Airplane Graveyard? 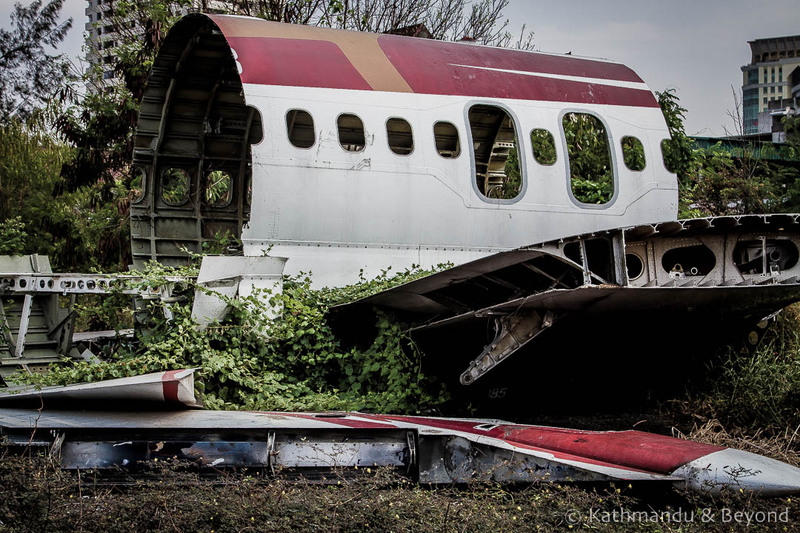 The simplest way is to reach the Airplane Graveyard is to take a taxi. The address is 594 Ramkhamhaeng Road/Ramkamahaeng soi 103. The site is next to a car repair shop and nearby there is a large apartment block called Assakarn Place Condominium. Ramkhamhaeng Road is one of the busiest roads in Bangkok so avoid rush hour if you intend to take a cab. A cheaper alternative is to take the Khlong (canal) Saen Saep express boat. Line 2, the Golden Mount Line, runs from Tha Phan Fah Leelat (shown as Panfa Leelard on some maps) to Wat Si Bun Ruang. The Tha Phan Fah Leelat stop is walking distance from the backpacking mecca of Khao San Road and the ferry stops at other handy points along its route including Chitlom, Wireless and Nana. The ferry is also busy (with commuters) during rush hour plus there is a certain knack to getting on and off the boat, but it is by far the most convenient means of completing the journey and with a maximum price of 20 Baht per person one way for a ride, it is also very inexpensive. 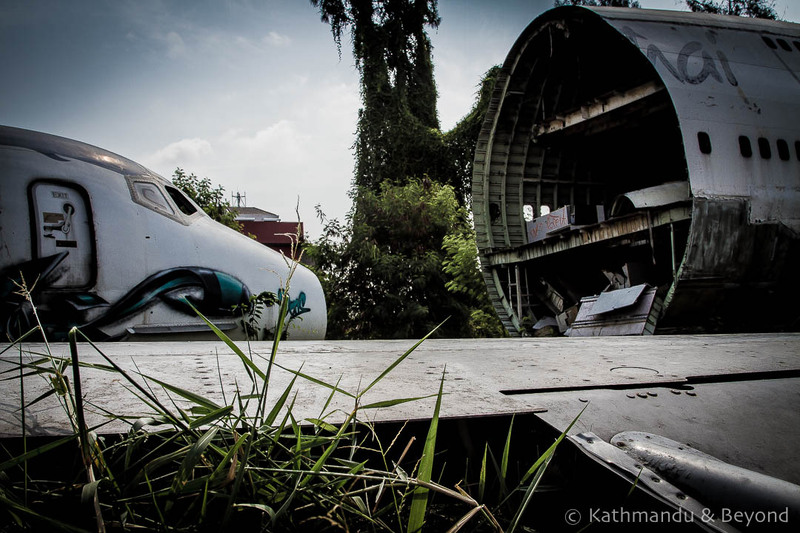 Conveniently, the airplane graveyard is located close to Wat Si Bun Ruang, the last stop on the ferry’s route. 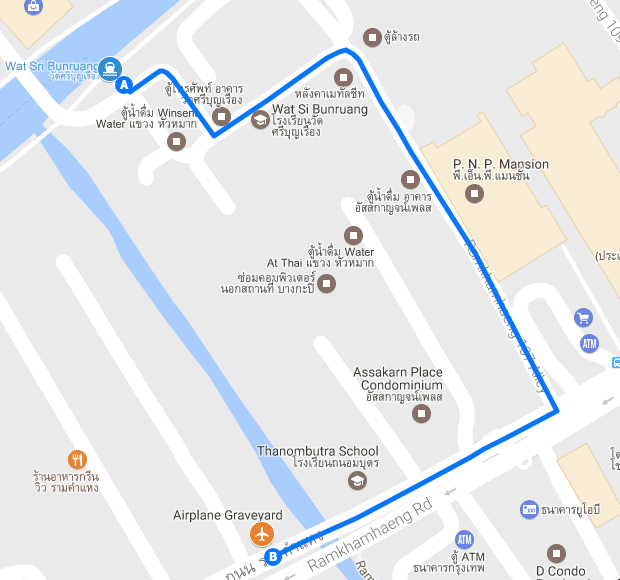 After you have disembarked, walk around the temple in a clockwise direction and up to Ramkhamhaeng Road. 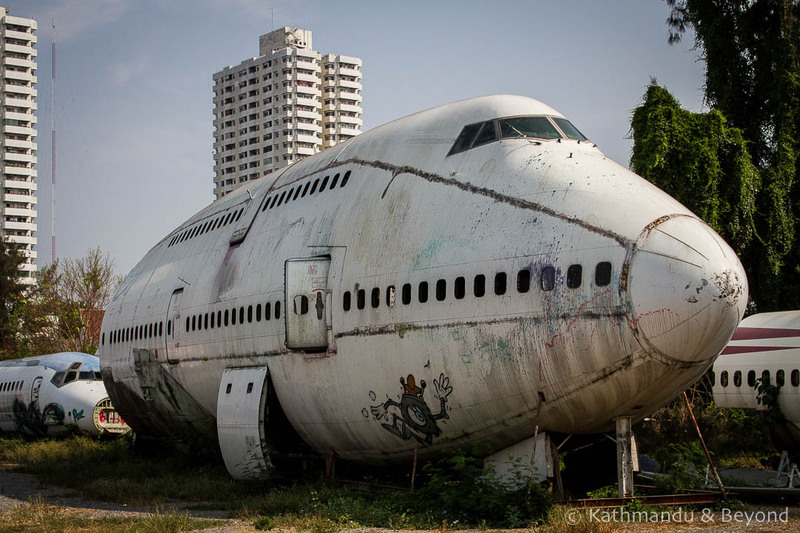 When you reach Ramkhamhaeng Road, turn right, walk past Assakarn Place Condominium, over a small humpback bridge and what you are looking for will be on the right-hand side – the enormous Boeing 747 will give it away! Click here for our Google map version of this map. 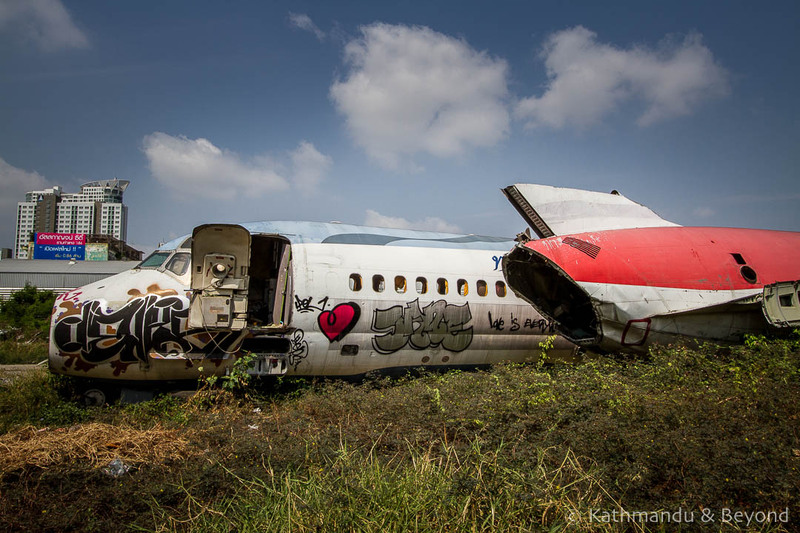 When is the best time of day to visit/photograph the Airplane Graveyard? From a temperature point of view, as early in the morning as possible is the best time to visit. For photography, the light is OK in the morning, but if you want a full-on, side view of the 747 and the other aircraft around it then the afternoon is better as the sun will be behind you. 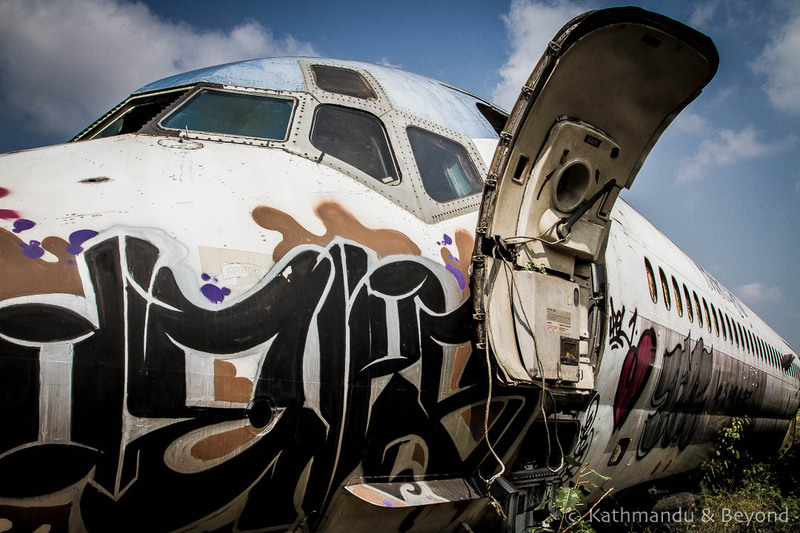 Is it worth visiting the Airplane Graveyard? 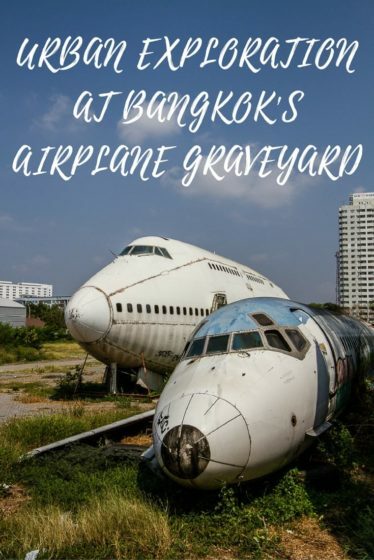 As long as you don’t get hung up and accept that you’ve gotta pay a comparatively high entrance fee, visiting the airplane graveyard in Ramkhamhaeng is a unique experience that you won’t be able to repeat in too many destinations around the world. Even if you are not into scrambling around in precarious locations, it is still worth visiting and admiring from the outside. Kirsty isn’t into clambering and left all that to me but she would still say it was a worthwhile excursion. 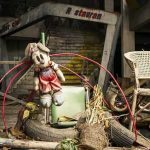 Assuming you take our advice and travel there by ferry, the worst case scenario is that you will have got to witness life on one of Bangkok’s numerous canals. Travelling on one of these ramshackle boats is experience in its own right and an essential, must-do for anyone visiting the city. Of course, the information in the post could become obsolete at any time. 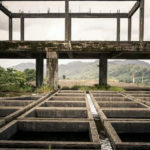 The owners of the land may decide to sell it, the families who live there might be stopped from allowing visitors to enter in return for a fee (especially if the Thai police find out and the inhabitants don’t give them their cut) but on the other hand, more unwanted aircraft might be dumped on the land and salvaged for scrap and the site could become even more impressive than it is right now. Who knows, but if you are in Bangkok and fancy something different, then give it a shot! How do you suppose the aircraft got there? Is there an adjacent landing strip long enough for a 747? That’s a good question. There is no landing strip on the land but there is an aircraft hanger. 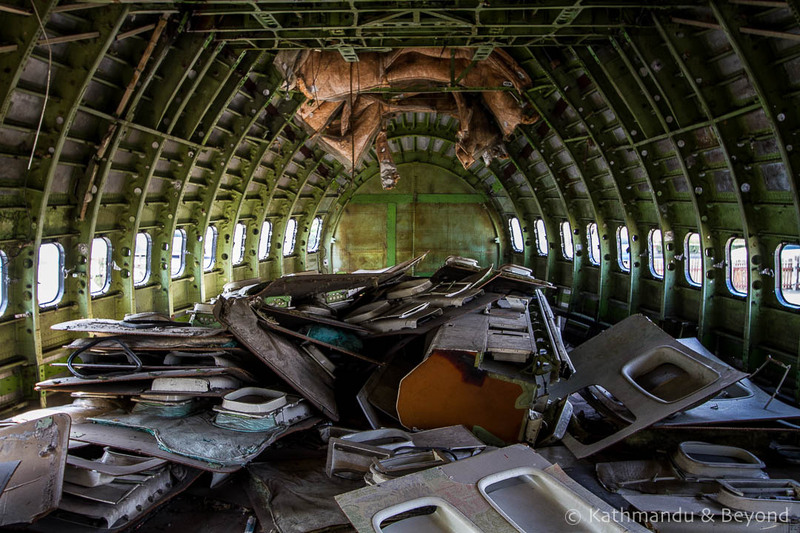 Everything there is in bits so I’m assuming the planes were dismantled before being transported to the site. The airports are quite far away.